Man On Wire: 94 minutes. Rated: PG. Director: James Marsh. Young @ Heart: 107 minutes. Rated: PG. Director: Stephen Walker. 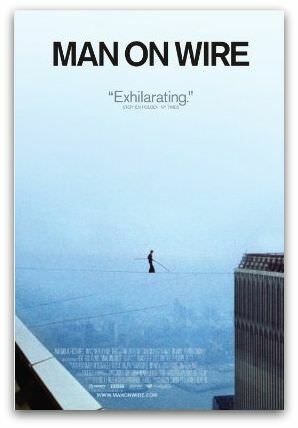 In 1974, Philippe Petit balanced mortality and destiny on a wire between New York City's Twin Towers, then the tallest buildings in the world. It was the fulfilment of an existential quest that began many years earlier, when the philosophical acrobat Petit first saw a diagram in a magazine of the soon-to-be-built towers. Man On Wire recreates Petit's dizzying pursuit of those towers. Director James Marsh gives the documentary the tension of a crime caper thriller, winding vivid monologues from Petit, and the friends and shady ring-ins who helped him, around dramatic recreations and field footage from the event itself. Logistically, Petit's inspirational but illegal feat had the hallmarks of a bank heist. Transporting the heavy cable to the towers' peak and then rigging it was difficult enough. Discovery by security guards would mean the end of months of planning and years of dreaming. Petit and his accomplices needed to be discreet. That's not to mention the more obvious dangers of balancing on a wire suspended 400 metres above the streets of Manhattan. It gets pretty windy up there. The physics of the feat itself required as much forethought and planning as the logistics of being in position to perform it. At the centre of it all is Petit, the driven, charismatic and decidedly self-obsessed French acrobat. During the years prior the Twin Towers walk he trod wires atop the turrets of Notre Dame and the uprights of the Sydney Harbour Bridge. He waxes lyrical about the physical poetry of conquering such beautiful stages. It is inspiring, despite the temptation to question his sanity. Seeing footage of the wire-walker Petit alone, afloat in space, you appreciate the loneness of his being. His closest friend, and his long-time girlfriend, faded from his life after helping him walk the Towers. They are less pragmatic about the parting of ways than he. It seems Petit's sense of destiny burned too hotly for these bonds to withstand it. In contrast to Petit's unrelenting singularity of purpose, Young @ Heart, a very different but equally entertaining documentary in cinemas this week, is testament to the simple yet profound joy of having something to get out of bed for. For the members of the titular choir, mortality is not a mythical abstract. Their average age is 80. The chorus takes its repertoire from rock and pop bands such as The Clash and Coldplay. Many members hate the songs selected by chorus director Bob Cilman. Their undisguised distaste as rehearsals begin on Sonic Youth's noisome 'Schizophrenia' is hilarious. But they can't conceal their elation at audiences' responses to their one-of-a-kind live act. In addition to conversations with the variously feisty or gentle chorus members, and rehearsal and performance footage, filmmaker Stephen Walker includes stylised, music video style segments, with the chorus members hamming it up in the spirit of MTV cheese. These more than anything else evoke the personalities of the individuals and the idiosyncratic premise of the choir itself. It's all very feelgood and unashamedly schmaltzy — by turns hilarious and heartbreaking. Age and mortality are present realities, and two chorus members die during the course of filming. A vocal tribute to one of the fallen members, during a performance at a prison on the day of his death, is a perfectly contrived tearjerker moment. Less manufactured moments are more affecting. When a former member returns from a long illness, he tells Walker, with tremendous gravity, that he'll be devastated if his longed-for comeback fails. It is heartbreaking to see him arrive at rehearsal looking feeble, and unable to give voice to his song. The film's most enigmatic character is Cilman, whose motivations are never explored. The fact he has been leading the chorus for 20 years suggests love is a big part of it. Yet he's a hard taskmaster, abruptly abandoning one song — James Brown's 'I Feel Good' — when a soloist forgets the lyric. Come showtime, the song is back on the agenda, with the soloist struggling until the last to remember his lines. It's a showstopper. This speaks volumes of Cilman's methods and motivation, and the compassion that underpins his leadership. READERS RECOMMEND: What movies have you seen lately? Post your own 200 word reviews below!